Whether you manage a bank or run your own beauty salon, the security of your business will undoubtedly be a key priority. This can be frustratingly hard to manage, when all it takes is for a brick to smash your window for thieves to breach your property. In fact, this is how the majority of break-ins take place. Luckily, the glass industry has responded to this problem, and offered a more secure solution to help prevent commercial break-ins. Security glass is a toughened glass designed to endure forced entry attempts, and prevent your windows from being your premises weak point. How does Security Glass protect your business? Anti-vandal security glass is a modern alternative to barred windows. Security glass is manufactured by building up layers of glass with ultra-strong, penetration resistant interlayers between each leaf of glass. So, even if a layer of glass is broken in a manual attack the tough plastic interlayer stops or slows the progress of the attacker. How resistant are security glass windows? These panels are proven to resist blows from a range of blunt objects, including the most common weapons of choice: bricks, stones and scaffolding. This makes it far harder for thieves to gain access to your property, as traditionally weak points like glass windows and patio doors are no longer so easy to break through. In fact, the security glass windows are so tough that it takes minutes of trying before repeated blows even cause a crack to form. By the time this happens, most would be thieves are deterred by the sheer effort involved. Even better, sometimes simply have a small sticker in the corner of your window, advertising the durability of the glass, can deter break in attempts before they even begin. What if Security Glass windows break? 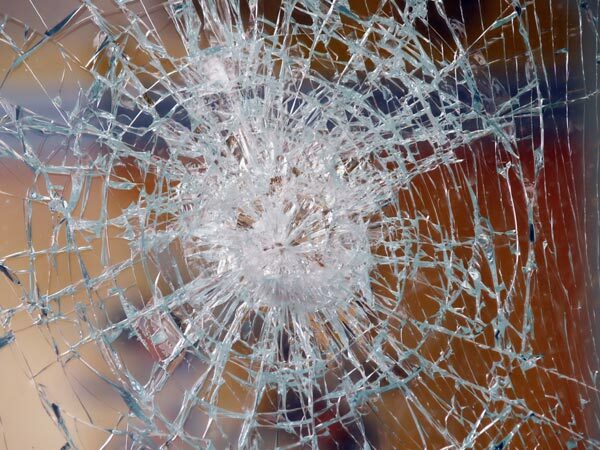 While a security glass window will resist the majority of impacts, the panes will eventually crack if the attack is forceful and prolonged. Once they crack, the majority of shards remain within the window frame. As a result, there’s yet another layer of glass that the trespassers need to break through, and they need to do it after the sound of glass breaking may have already alerted the authorities. Since thieves or vandals have to spend so much time acting conspicuously outside your property, it’s quite likely the alarm will be raised before they can finish their burglary. This gives you more time to respond to the emergency, and for police or security to arrive to the scene of the crime. Need to increase the security of your business? For more information on how security glass windows can protect your business, contact Diamond Glass today. Our team would be happy to discuss the specifications of your project, and how it can enhance your property’s security.